Porridge and I- our relationship’s been a long time in the making. A tumultuous one. Love-hate, if you will. My Mum used to try and feed me porridge when I was a tot, and I used to hate it so much it would make gag. She gave it up as a lost cause, and I didn’t voluntarily touch it for years. When I got a bit older though, I always loved the idea of waking up on cold mornings to a bowl of warming porridge, and eating it whilst wearing a thick dressing gown before the sun has even risen. That part in Harry Potter when J.K.R writes about Hermione ‘spooning liberal amounts of jam onto her porridge’ captured my imagination even more so than that already fairly idealistic and dreamy image. I still couldn’t bear eating it though, not until Jason came along. He somehow has this special way of making the most delicious oats you could imagine. I remember him making a bowl of porridge for his breakfast one Saturday morning during the first few months we were together (during the months when I lived in London, and used to travel home each weekend to stay with him), and after tasting one tiny spoonful, loving it so much that I ate more than half of Jason’s breakfast and left my toast to go cold! I’m not quite sure what he does to it, but porridge made by Jason is, and always will be, my favourite winter breakfast. And so because of that, these recipes here are for toppings and flavourings alone. We’ll leave the oats and milk and stirring up to those who know, but toppings? That I can do. These flavour combinations are some of my absolute favourites. They’re sweet enough to satisfy the sweet tooth I always wake up with (and have all day long and go to bed with…), but don’t feel at all sickly or like you might need to eat salads for lunch and dinner as compensation. 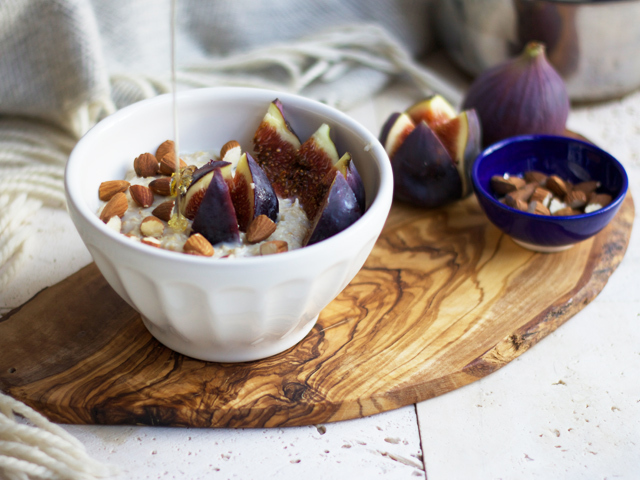 O N E :: Fig, almond, + honey porridge. Make porridge to your favourite consistency (I have it on good authority from Jason that a mixture of semi skimmed and skimmed milk works well, and is what I like best! ), then top with fresh sliced figs, almonds, and a drizzle of honey. Almond milk in place of regular might work well here too! 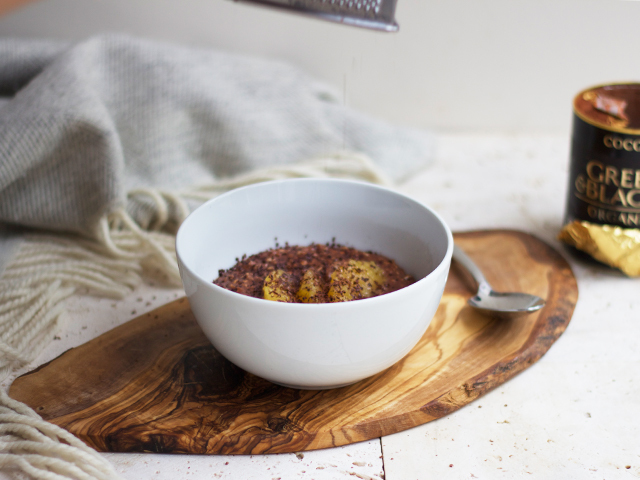 T W O :: Cocoa + orange porridge. 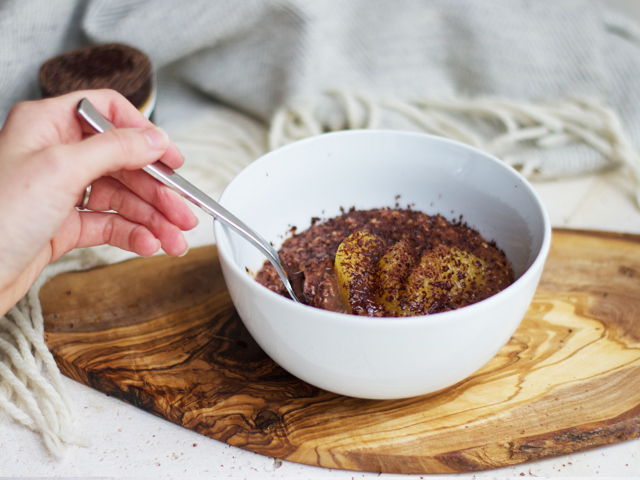 For a single serving of porridge, stir in a half dessert spoon of cocoa powder, the same amount of soft brown sugar, and top with sliced, skinless orange segments. Grate over some 100% chocolate (I used the Willie’s 100% Indonesian bar, which is delicious), and serve! This one’ll need more milk than normal to loosen the consistency, since the cocoa does such a good job at thickening it all up. This one might just be my favourite of all favourite porridge flavours! It’s like dessert for breakfast, and there’s not a single thing wrong with that. 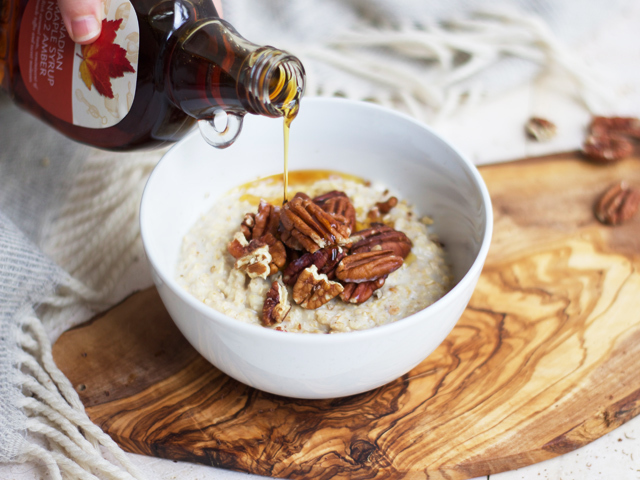 T H R E E :: Maple + pecan porridge. Add a dash of maple syrup to the porridge in the pan when it’s cooked through, and then another drizzle over the top when it’s been served up. Top with a crumbly handful of pecan nuts, and eat right away. Oh yum! I love porridge, but I tend to have the standard flavoured sachets at work, and therefore never experiment with different toppings and flavours – maybe something I need to start doing over the weekend! Cocoa and orange?! Such a good idea, why have I never thought of that before! I spent the whole of last year having honey and banana porridge every morning which is admittedly ultra yummy and healthy, but I definitely want to try out some more indulgent flavours. Maple syrup always reminds me of pancakes, so that’s another excellent idea! They all look delicious! I think I will definitely be trying the chocolate and orange one. My favourite is to stir in frozen or fresh raspberries and cover it all in brown sugar. OHM pecan and maple anything is so good! I have been enjoying some coconut porridge recently – so good for these beautiful crisp mornings! Porridge is my absolute favourite breakfast! My favourite toppings include crunchy peanut butter & banana, golden syrup & flaked almonds, and desiccated coconut & raspberry jam. So yum! These all look utterly delicious! Got to say though I’m a sucker for keeping it classic – either a dollop of jam, a swirling of honey, or a great big spoonful of Nutella keeps me happy no end! Oooh do these all look yummy! Personally, I like my oatmeal with a few little bits of vegan dark chocolate, currants, and either hazelnuts or almonds chopped and mixed in. Porridge/Oatmeal is such a versatile breakfast – yum! why did i never think of cocoa porridge before?! These look lovely – my personal favourite is a spoonful of Nutella – amazing! These toppings all sound delicious! I’m just starting to get in the mood for porridge again too – tomorrow’s breakfast, methinks! Yum, all of these toppings looks delicious! I’m a fan of golden syrup with sliced banana, but the fig one in particular looks extra good! Yum! 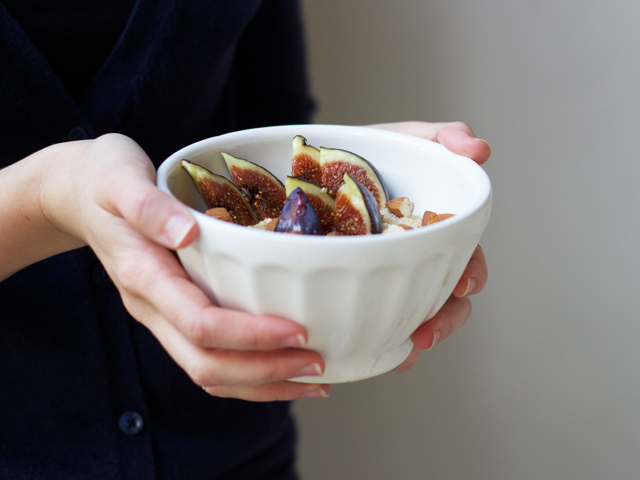 These look amazing, and I particularly love the idea of including figs. My favorite way is pretty simple – some brown sugar and raisins. 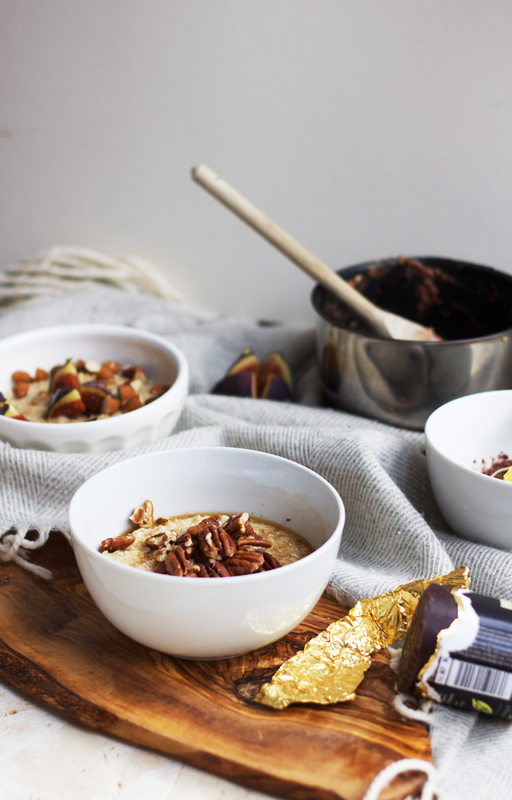 That porridge with the maple and pecan looks like the absolute dream, Rosie! I do love the classic chopped banana and honey/peanut butter though. Literally a hug in a bowl! These sound delicious, thank you for inspiring me! 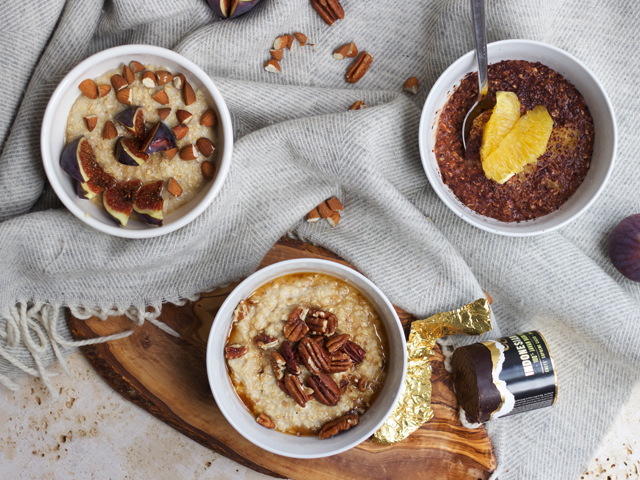 Now that the weather has turned colder and the mornings are crisp, I’m ready to bring out the porridge for a warming start to the day and these toppings sound perfect for keeping it interesting throughout the winter months. I love that you totally justify a sweet breakfast- we all need a treat to start the day with! What fabulous ideas Rosie, thanks for the porridge inspo. It was the only thing I used to eat as a kid. Ahhh can’t wait to try it. Mmmm…maple and pecan looks yummy! I might have to branch out and try that sometime. I still have mine the same way my mom served to me when I was little–with a little butter melted on the top and sprinkled with brown sugar. What can I say…I’m a slave to tradition. I love the pecan and maple syrup combination. Blueberries, a spoon of Greek yogurt and honey always win it for me! Oh, I love porridge, it’s such a great winter breakfast, but I’m usually running so late in the mornings that it’s a weekend breakfast. Although the bar I work above serves a delicious cinnamon porridge for when I am needing a week day hit! Mmm I love porridge I haven’t had it for ages because I don’t have a microwave so never feel like making it on the hob :P The maple and pecan one is my favourite!